Still looking for a last minute gift? Here are some suggestions any 4-wheeler would love to receive. Use the Off-Road Kit to turn your Hi-Lift Jack into an even more versatile tool. This kit keeps all of the needed parts for winching at arms reach. The Handle Keeper is a “must have” for any Hi-Lift jack owner. Made of Polyurethane, it slips over the jack’s “I” beam and jack handle to keep them parallel and secured together. In addition to securing the handle while in transport, it also acts as a “buffer” between the jack handle and the jack “I” beam eliminating clanging. Designed specifically to fit over the top of ALL Hi-Lift jack models without having to remove the Top-Clamp Clevis. This is very important so the Handle Keeper can be removed quickly and easily while using the Hi-Lift, so that it won’t interrupt the proper and safe use of the Hi-Lift (allowing the jack handle to be placed in the full upright position during use). The 4 in 1 tool set would be perfect for my Dad. We love to camp, the whole family. Thanks for the super idea. I know he’ll be surprised and grateful. 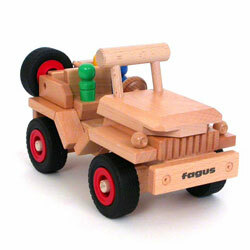 Hey, I want the toy Jeep at the top of the page. My son would think that was so cool. Where the heck did you find it? Of course, what he really wants is one like mine, but since he’s only 4, this one would be more his size! The Hi-Lift Off-Road Base sounds like a very useful thing to have. I’ve been looking for a gift for my husband and I think this is it. That multi function tool would be a great addition to my Jeep. I’m going to put a bug in Santa’s ear and hopefully she has procrastinated and not got me anything for Christmas yet. I sure would love to see that under the tree come Christmas morning. You’ve given us so many great suggestions. The only problem I can think of is I don’t know which one to pick. I obviously can’t affore all of them and they all would be great things to own. I bought my hubby the hi-lift jack for his birthday last month. At the time I wasn’t even aware there was a handle keeper that can be used with it. Guess he’ll be getting that for Christmas. We spend a lot of time in outdoor activities both at home and while traveling on weekends. The multi-function tool kit will be a great addition to our supplies. Thanks for all of the great ideas you’ve provided.